Members of the press are welcome to contact the Office of Lama Jampa Thaye and we will respond to your query as soon as possible. Please use the button below to send an email or call Roz Haddon on +1-646-248-1414 PST. Two alternative biographies for the press are provided below and a few additional photos. Please do not hesitate to contact us for further information. Tibet was a unique storehouse of Buddhist wisdom in 1959 when China’s Red Army invaded and ransacked its ancient culture. Thousands of monks and lamas were forced into exile, but Tibet’s great loss was the world’s gain as powerful teachers with rich spiritual pedigrees turned their attention to the West. Several years later, a bookish young man from Bolton, Lancashire, UK called David Stott found his own route into Buddhism via the writings of Jack Kerouac and America’s Beat poets. Trying out and discarding mind-expanding drugs and other false panaceas of the hippy years, in 1973 he had his first encounter with exiled Tibetan lamas, in particular a teacher who is nowadays based in Nepal, Karma Thinley Rinpoche. In recent decades many westerners have spent a year or two dabbling in Tibetan Buddhism, attending retreats and receiving teachings. Some have spent shorter or longer periods in Tibetan monasteries, and a number of them returned to their countries and offered themselves as authentic Buddhist teachers. David Stott’s path was different. Like the lamas he admired, he set great store by learning: he gained a doctorate in comparative religion and taught the subject at Manchester University for more than 20 years. At the same time he applied himself to the spiritual path as the lamas he admired understood it: becoming fluent in classical Tibetan, and receiving teachings in the original language from Karma Thinley Rinpoche and a host of other high lamas. After 15 years of intensive study, he received a unique accolade from that first teacher: the right to call himself a lama, and to confer initiations into the most esoteric Tibetan spiritual practices – the Vajrayana. Few other western teachers of Tibetan Buddhism have a comparable claim to authority. As Lama Jampa Thaye, he is the founder and head of numerous Buddhist centres in the UK and elsewhere, and travels constantly to deliver teachings to his hundreds of students. Despite a hectic schedule, he cleaves closely to the “warmth and sublime ordinariness” of the lamas to whom he owes his insight and knowledge. For Lama Jampa, the kernel of the Buddha Dharma is simple: it is the key to both understanding and ending life’s sufferings. Western society is full of seekers these days - people who have been let down by traditional western creeds. They have lost a spiritual connection, disappointed by morally challenged leaders, and they are no longer willing to take that “leap of faith” required to practice western religions. Many have turned to eastern culture, especially Buddhism, where no such leap of faith is required, just an intensive look at the true nature of reality. Yet a problem has arisen: there remains a dearth of authentic teachers tasked with guiding an overwhelming number of students. The result has been chaos: a hodge-podge of cobbled-together practices and spiritual seekers finding temporary asylum with inauthentic teachers looking to “monetize” spirituality, and practicing “spiritual charlatanism.” The root cause of the problem is the difference in cultures. Teaching without western cultural references makes it difficult to transmit the Dharma (“teachings”) on a deeply personal level to western students. One solution to this problem is to train a westerner, make sure he understands and can teach the Dharma as it was taught in the traditional way, passed down over 2500 years, directly from Shakyamuni Buddha, and task him with teaching Buddhism to westerners in a manner they can grasp more easily. That person is Lama Jampa Thaye, a western-born lama authorized by the heads of both the Sakya and Kagyu traditions (H.H. Sakya Trizen and H.H. The 17th Karmapa Trinley Thaye Dorje) to transmit the highest, most complex form of Buddhist meditation (the “Vajrayana” sometimes called “deity yoga”). With his emerging view on reality at such a young age, it was only natural that Lama Jampa would be drawn one day to the Dharma. That came at age 13. In a local bookstore he noticed, “Seven Years In Tibet” by Heinrich Harrer on a shelf, and felt a connection. He begged his father to buy it for him, and reading it was a revelation to him. His study of Buddhism began. At age 16, inspired by Jack Kerouac’s “Dharma Bums,” he left Bolton and headed for London on his own and got involved in the so-called “Counterculture,” working for the radical newspaper, The International Times, and with the famed alternative arts center, The Arts Lab. The end of Lama’s hippie days coincided with the start of his studies at the University of Manchester, where he subsequently received a bachelor’s degree in Religious Studies, then an eventual doctorate for his work on Tibetan religious history. At age twenty, through a stroke of luck, he met a highly respected figure in Tibetan Buddhism, Karma Thinley Rinpoche, who has the unique distinction as a designated master in both the Sakya and Kagyu traditions. Karma Thinley Rinpoche had been asked to teach at a Buddhist center in Edinburgh, and Lama Jampa travelled north to meet and study with him. Soon, Karma Thinley Rinpoche saw Lama Jampa’s immense aptitude for understanding the Dharma, and eventually, in 1977, appointed him as his dharma-regent (spiritual representative and heir). Through Rinpoche, Lama Jampa met, and became a student of His Holiness Sakya Trizin, the head of the Sakya Buddhist tradition and one of the most revered and respected figures in all eastern culture, considered by many to be one of the great Vajrayana teachers. In 1988, as a result of his completion of the necessary retreats and textual studies, Karma Thinley Rinpoche gave Lama Jampa the authority to carry out the activities of a lama (including bestowing Vajrayana initiations, the highest and most complex form of meditation in Buddhism), with the hope that, by appointing the first non-Tibetan in this manner, Lama Jampa would serve as a bridge between two great cultures. Karma Thinley Rinpoche also asked Lama Jampa to help him fulfill his duties and establish Buddhist centers; the first started in Manchester, England and named “Kagyu Ling.” Now known as The Dechen (“Great Bliss”) Organization, Lama Jampa has opened centers throughout the west, including Los Angeles and a retreat center in France called Sakya Changlochen Ling. As these centers were created to serve both H. H. Sakya Trizin, the head of the Sakya tradition, and H.H. Karmapa, the head of the Kagyu tradition, some Dechen centers are affiliated to Sakya, others Kagyu. Throughout all this, Lama Jampa remained a “householder” (non-monastic) who married and raised a family, was divorced, re-married, and held a teaching position at the University of Manchester in Comparative Religion. This conventional life experience has helped him teach the Dharma to others, not just in a broad esoteric sense, but also as a practical, day-to-day practice. In 2001, Lama Jampa retired from his university position and dedicated his life to teaching the Dharma. He now travels the world teaching and transmitting traditional Buddhist practices, usually accompanied by his wife Albena and youngest daughter Katie. When popular book publisher Thorsons was creating their “Way Of” series on the religions of the world, and needed an author to write the book on Tibetan Buddhism, they chose Lama Jampa Thaye. The resulting definitive narrative, “Way Of Tibetan Buddhism” was one of many books written by Lama Jampa (see list below). Shamar Rinpoche, a famous and beloved Tibetan lama who founded a world-wide organization known as Bodhi Path, passed away in 2014. One of his wishes before his death was to have Lama Jampa Thaye travel to all of his centers in the United States and teach traditional Tibetan Buddhist philosophy and meditation. By October 2015, Lama Jampa fulfilled that wish. The fact that Lama Jampa was taught and sanctioned by the world’s greatest Tibetan lamas, and for well over forty years has stuck with those lamas, never straying or branching off with his own form of teaching or philosophy, makes him a part of a pure lineage leading back to Buddha. 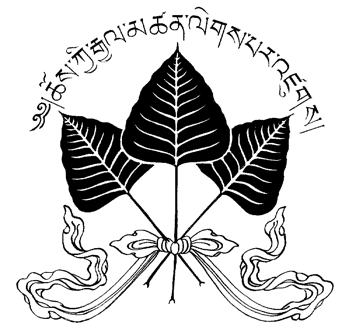 When receiving a teaching or initiation from Lama Jampa, the student is hearing the same teachings Buddha’s first students received 2500 years ago, except through the eyes of a westerner, galvanized with western cultural experiences and the ability to apply the teachings to the concerns of his fellow westerners. This makes Lama Jampa Thaye not just an extraordinary teacher, but also a rare sort of phenomenon.